Code Black's fall finale is approaching, which means that fans might go into a "code black" themselves where the need to watch a new episode far exceeds the number of new episodes available. 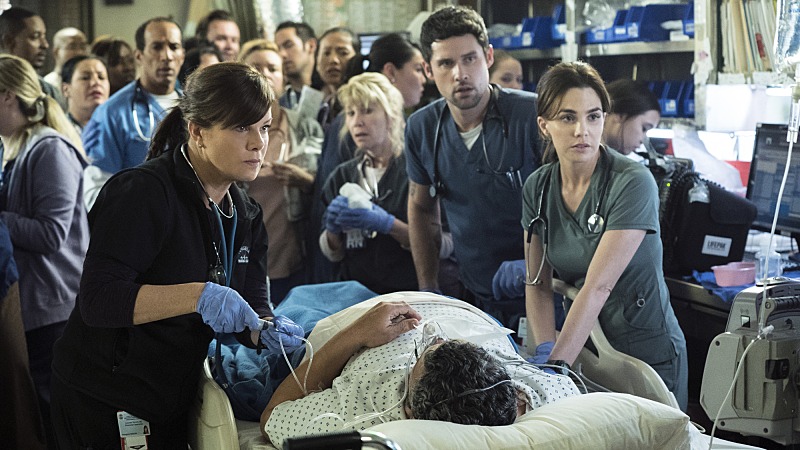 Fortunately, when Code Black comes back on Jan. 13, 2016, fans will be able to rejoin the doctors of Angels Memorial as they do their best to save patients and reserve resources in the country's busiest ER (with occasional visits from the touring casts of Broadway musicals, as evidenced in the recent The Lion King crossover episode). However, if that Code Black-less month feels like too long a wait to be without your favorite cast of medical professionals, then spend this hiatus watching the cast's other equally awesome projects! Code Black has one of the strongest new drama casts of the season, featuring Hollywood veterans like Marcia Gay Harden and Luis Guzmán in addition to up-and-comers like Melanie Chandra and Benjamin Hollingsworth. Code Black is the cast's present project, but, during the hiatus, take some time to re-visit their past projects to see just how talented and capable of range these actors are. Here are my suggestions for temporary Code Black hiatus treatment. The short-lived series Trophy Wife featured Marcia Gay Harden displaying her comedic skills opposite an all-star cast of some of the funniest women working today. If you want something a little more upbeat than the hectic halls of Angels Memorial, this is a good choice. Remember Smash? How good was that cast? Megan Hilty, Christian Borle, Jack Davenport, and Code Black's Raza Jeffrey along with so many more talented people! One can only imagine what would have happened if this show hadn't been canceled before Hamilton-mania swept the nation. Code Black's Bonnie Somerville is no stranger to grit as she displayed in the cop drama Golden Boy, about the rise of New York City's youngest police commissioner. If you want your temporary Code Black replacement to have the same amount of blood as the medical drama, this is your best bet. Before joining the staff of Angels Memorial, Melanie Chandra was playing younger sister to Aasif Mandvi in the HBO war comedy The Brink. It's unclear whether she'll be returning for The Brink's upcoming second-season now that she's busy tending to patients on CBS. Luis Guzmán has been acting since the 80s, and even had his own self-titled sitcom at one point! Luis Guzmán plays smart, optimistic nurse at Angels Memorial — which is a far cry from his other role in a television series this year. On the Netflix original series Narcos , Guzmán plays real-life drug lord José Gonzalo Rodríguez Gacha, which as far away as you can get from Nurse "Momma" Salander. While no medical drama currently on television (aside from The Knick) has the grit and realism of Code Black, hopefully one of these shows will help you spend time with the cast before their return to CBS on Jan. 13.